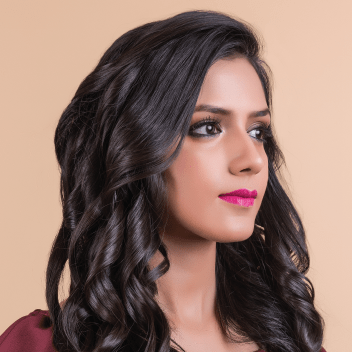 UrbanClap brings to you the top makeup artists in Pune right at your doorstep to save your time from visiting parlors.Whether you are lokking for the best HD makeup in Pune or the best airbrush makeup in Pune for your wedding, we have got you covered. We offer you the best bridal makeup in Pune from the top wedding makeup artists in Pune. All this with a just a click! It's the best one in town. Wide range of services. Staff is very cordial and well mannered. The place is hygienic and clean. They truly know how to pamper you. A good and perfect hair stylist. I have been using his services for now close to 5 years. What is talent? Meet Javed! An Artist, quickly understands the style. V professional, keeps up with the current trend and has d art of making you look graceful n classy. Cheers..!! Fantastic service. Would recommend and hire again. It was my daughter's wedding when I hired her as my makeup stylist. I came to know about her through my friend. Not only me, but she also made my daughter and my friends ready. Before starting with the makeup, she understood our requirements and used all branded products. She gave everyone different looks and gave my daughter a bridal look. She gave me a natural look and made sure that the makeup was long lasting. She was always open for any change required. I was very happy and satisfied with her work. I received many compliments, and people has asked me about her. I have already recommended her to others. She is a very good make up artist.she is very polite n confident in her work.m fully satisfied to her work. Thanks rozy once again. Very higenic soft spoken.. Well dressed and professional.. I would like to book her again in future.. It was my wedding anniversary, and I had organised a party for which I required a makeup stylist, She did my makeup for the party. Sanya is an excellent makeup artist and helped me in my hairstyling also. She used quality makeup brands and was on time for the makeup. She gave me a natural kind of look, and she did it according to me and my needs. Prices were fair and worth paying. We have heard a lot about Sanya's makeup styles, and we hired her for my brother's marriage, all our guests were very happy and appreciated her work a lot. We had taken her services in the past, but this time it was a significant and important function for which she gave us her best services. She had done the makeup for many of our guests. She was ready for the changes also if required by any one of us. I was very much satisfied with her services. Highly recommend. She is excellent and well knowledge in her field. Also friendly with her clients.. If you wanna feel gud for your look then you should hire her. Savita really knows what she is doing. She makes sure to understand your requirement and choices. She doesn't force her styling method on you and advices you whether the jewellery would go with make up or not. She styled me very well for my wedding. I will definately look to book her for next life events. 9 Dusky Bridal Makeup Looks That Are Young, Fresh & Fabulous! Tell us your requirements and get custom quotes with profiles within 24 hours from upto 5 interested Bridal Makeup Artists. Check their portfolios carefully: As nowadays makeup artists put out their works on social media or have their own websites, you must ask for their portfolios. Portfolios would not only give you a basic sense of their personal preferences in terms of style but also give you a sense of the variety in their works. Variety shows if the MUA (makeup artist) can work on different colours and types of skin. Any good professional MUA knows the style choices of their clients and this will help you get a customised look for your wedding. Just do not hire if their portfolios show just one type of makeup look on brides. If they are booked during your wedding dates with other appointments: If an MUA can come for your wedding as well, just make sure that there is enough time for him/her among the appointments and also consider the sudden delays. The MUA must never rush through to apply makeup for your big day. I’ve Found 2-3 Bridal Makeup Artists in Pune I Like. How Do I Finalise One? Call the makeup artists after you have liked a few and ask whether they would be free on the function dates of your wedding such as reception, sangeet, and wedding, among others. If they are free just ask about the makeup products they professionally use and the brands of products. Airbrush, HD and traditional are the three types of bridal makeup and airbrushing is a technique used for applying makeup while the other two are products of makeup. This common makeup has been applied to most brides for many years now. Skilled makeup artists use the professional line of traditional makeup products. It is highly versatile as any method, be it – sponge, fingers, and brush, among others, can be used. It can also be used for most occasions. While most of the traditional makeup products are not resistant to water but they are used to give a makeup look that is between a full coverage and a sheer. As there are different kinds of makeup available nowadays, there would be no problem in achieving a good result with traditional makeup products. A skilled MUA can always make a huge difference. However, if one has uneven areas the MUA would have to apply more to those parts that might result in a patchy effect when seen through a camera. As HD cameras can easily point out the caked up makeup look, HD makeup contains ingredients that give one a faultless finish. Your makeup would look better under an HD camera. As compared to traditional makeup, HD makeup is liquid-like and provides more translucence. It offers full coverage when applied and looks very natural in photos. In the airbrush method, a spray gun is used to apply the makeup. The airbrush technique gives you a smooth layer that reveals your actual colour of the skin. It does not have any cakey effect. Even though it lasts for 16 hours and is resistant to water, you should just dab your tears and sweat rather than wiping them. The best advantage of this method is that the foundation oxidises with air once it is out of the spray gun. This makes the real foundation colour show up immediately once it is on your face. With the other techniques, the foundation’s actual colour takes about 15- 20 minutes to appear. It is a highly accurate method as the MUA can easily control how much makeup should be applied to the problematic areas of the skin. The uneven areas of your skin appear better with this technique when seen through HD cameras even though it has more translucence. Since the technique has a natural approach, the makeup blends properly. 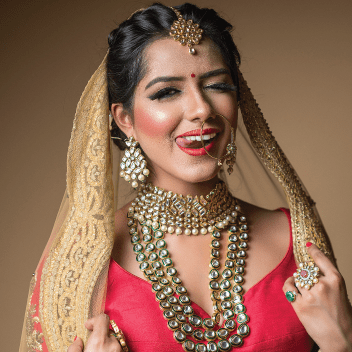 The makeup cost for functions such as sangeet, mehndi, and reception, among others, are cheaper than the makeup for the wedding day. Booking the same MUA for the different wedding functions would be better as you would get a discounted rate on the overall price. The bride has to pay for the MUA’s travel to a different city along with the expenses for accommodation. What does a Bridal Makeup include? A trial session should be done a month prior to the wedding. You can check the makeup artist’s worth with the trial session. It will also allow you to change your makeup look for the wedding if you don’t like from what you had earlier thought. If an MUA is not sharing the list of bridal makeup services and rates or is reluctant to book a trial session, don’t book her/him. Are they paid or free? Bridal makeup trials are generally paid but they are adjusted into the final payment if you hire the same MUA for the other wedding functions. Full-face trial: With this trial, the MUA would show you how you would look on your wedding day but it will not be done perfectly. Full-face trials usually cost around Rs. 1500. Half-face trial: Makeup is applied to one side of the face so you can understand how it looks. The MUA can also put different eye makeups on each eye or put traditional makeup on one side and airbrush on the other so that that you can compare each other and come to a decision. What happens at a makeup trial? Show the MUA reference photos of the styles you like. Also show her photos of your finalised wedding dresses so that she knows how to give you a matching look. Discuss the products on how they would go with your skin, as well as your hair and eyelash extensions, and any other concerns. When the trial session begins, you must listen to what the MUA is saying and carefully make notes. What if I can’t travel to the MUA’s city for the trial? Requesting a friend or a relative and share some notes if you can’t make it to the trial session. Get on a video call after the session is done to discuss the particulars to know how the makeup would go with you. On what criteria should I judge my makeup at the trial? A professional MUA should know what makeup should be applied to different types of skin. For instance, if you have oily skin, the MUA should use a mattifying foundation. There should not be any rough lines after the makeup is applied and the blush, foundation, contour, and eye makeup should mix flawlessly. The base must look natural. After applying makeup, click some photos of yourself under natural and artificial lights. Check if the foundation’s colour is the same as that of your skin’s colour, if the blemishes or acne marks are concealed, and whether the dark circles have been correctly reduced. Dark circles should not be covered completely as it can look quite unnatural. You must consider how long the makeup would last. What other factors to consider before booking a Makeup Artist? 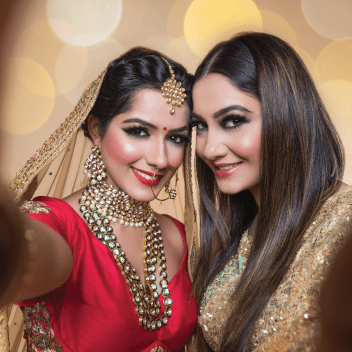 You should ask the important questions first: Once you connect with the makeup artists in Pune, enquire about the standard rates of bridal makeup services in the city. If you are allergic to certain ingredients or have sensitive skin, ask them if the professional products they use would go with your skin. Also, ask an MUA, if she/he is offering a bridal makeup service at a low price range, about the products and quality. You can find a balance between cost and good quality and you should not simply book a makeup service just because it is cheap. Enquire their hygiene practices: A professional makeup artist always practices good hygiene and keeps his/her kit along with the makeup products in germ and dirt free conditions. Check if the makeup artist is using clean brushes, washed up makeup sponges, mascara wands that are disposable, a mixing palette for the makeup products. The makeup artist should know where each product is kept in the kit. The artist should disinfect the makeup products on a regular basis. If an MUA is offering a bridal makeup service at a lower price range but is unhygienic or has a disorganized kit, don’t hire him/her. Let them know your style preference and see their reactions: If you prefer a simple makeup look or want to go with a bold one, ensure that the MUA pays attention to your choices. A good MUA can suggest you some ideas after you show her some makeup photos that inspired you. This exchange of ideas would give you the best of both worlds. A professional MUA always tries to understand the client’s style preferences. If an MUA is forcing his/her ideas on you and not listening to your request, just do not hire him/her. Enquire about the cancellation policy and the payment mode along with how much advance should be paid and when. Ask the number of people the MUA would bring along for the appointment to manage the space required. Ideally, book the same MUA for all the wedding functions as they will give you a bulk discount and you would feel more relaxed to request for changes for the succeeding wedding events. For example, if your eye makeup was too strong during the sangeet function, you can ask your MUA to apply less for the next wedding event. You should book a separate MUA who can apply makeup to your relatives and friends during your wedding. A bridal MUA would not have time to apply makeup to your relatives apart from you. Moreover, ask your MUA to bring along a separate team of makeup artists during your wedding. After the MUA has met you, she would know your hair and skin type and can suggest you for some treatments before the wedding functions take place. For instance, you may require a specific kind of hydrating facial if your skin is dry, or, you may need to get a basic cleanup for skin exfoliation. A facial is required 48 hours prior to the first function. Makeup should not be applied right after a facial. Waxing and threading are required to be done 24 hours before the first function, as the skin’s redness must settle down before the makeup is applied.